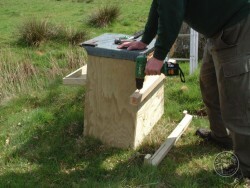 Step-by-step photo guide instructions for 2 fixing methods for exterior Barn Owl boxes. 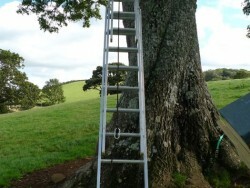 The first method is suitable for tree trunks; and the second is for trees with large forked branches. 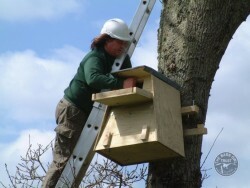 Remember to choose a position where the nestbox hole is clearly visible from a distance. 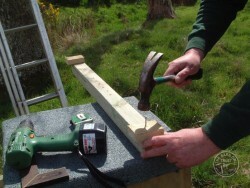 METHOD 1: pre-drill a 50x50mm batten. 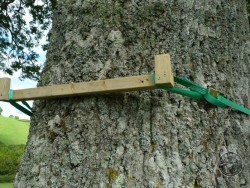 This is the Tree Batten. 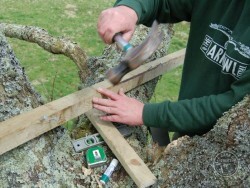 Fix a 25x50x90mm ‘hook’ at each end of the Tree Batten. 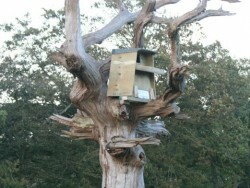 Another 50x50mm batten is strongly attached to the nestbox. 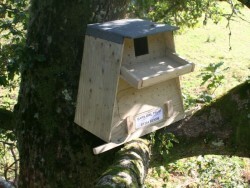 This is the Nestbox Batten. 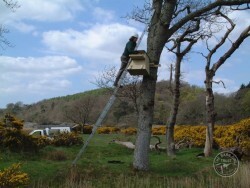 The Nestbox Batten will sit on the Tree Batten when erected. 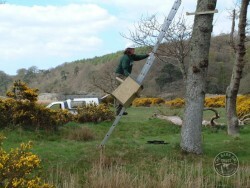 Carry the box up carefully. 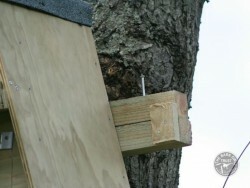 The hooks keep the Nestbox Batten in place . . .
. . . ready for fixing to the Tree Batten. Nails or screws work fine. 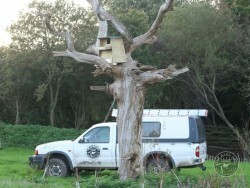 Depending on the angle of the trunk, you may need to fix a block of wood behind the bottom of the box. 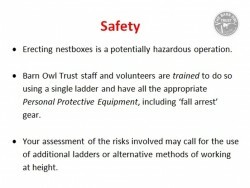 SAFETY WARNING: tree boxes are heavy. Use the appropriate Personal Protective Equipment. Gloves make carrying the box much easier. 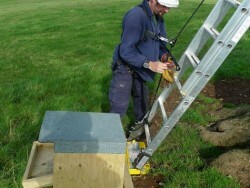 Fall Arrest Equipment allows you to use both hands. 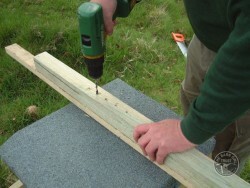 UV-stable Rachet Straps can be used instead of nails. 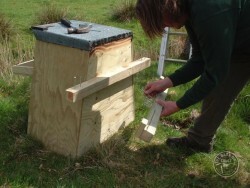 METHOD 2: attach horizontal 50x50mm timber into a tree fork . . .
. . . which the tree box can then be attached to. 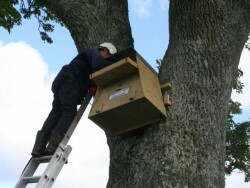 About Barn Owl boxes for trees – Do you have a suitable tree? 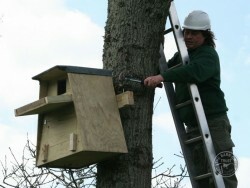 Photoguide: Choosing the right tree for erecting a nestbox. 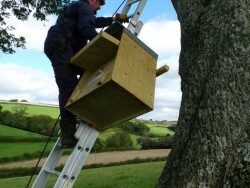 Buy a Barn Owl tree nestbox – Our recommended safe design.